It’s time to see what deliciousness was baked up for this month’s Treat Petite challenge. The theme this month was Childhood Memories and this obviously got the memory banks rewinding to back in the day! Firstly was Kerene from The Dream Baker. 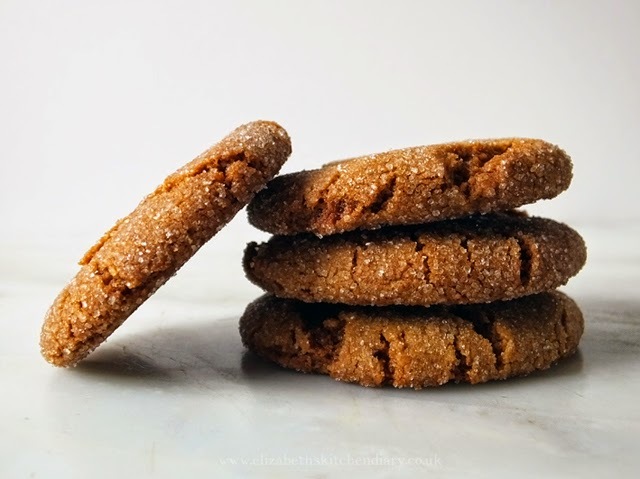 Danish Butter Cookies were a favourite childhood snack of hers and she reminisces about the tins of cookies which she had as a child. 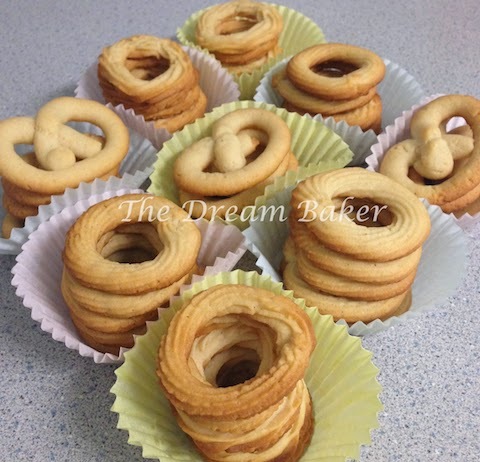 Kerene’s cookies are individually piped and look light and tasty. 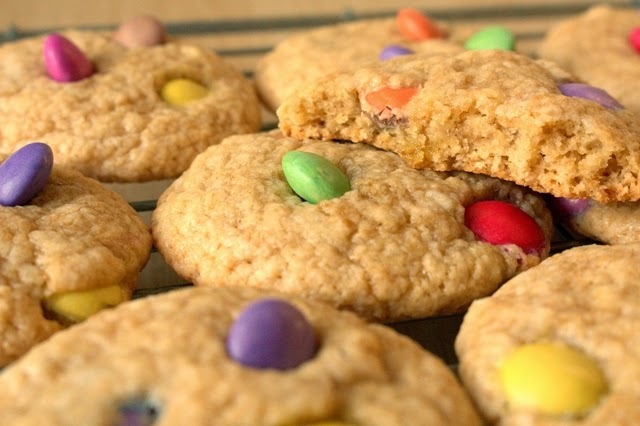 Laura at I’d Much Rather Bake Than came up with these Smarties cookies. Who doesn’t remember Smarties as a child? Laura explains as a child she mixed up teaspoon with tablespoon and you can imagine the result. Thankfully, that mistake didn’t happen here! 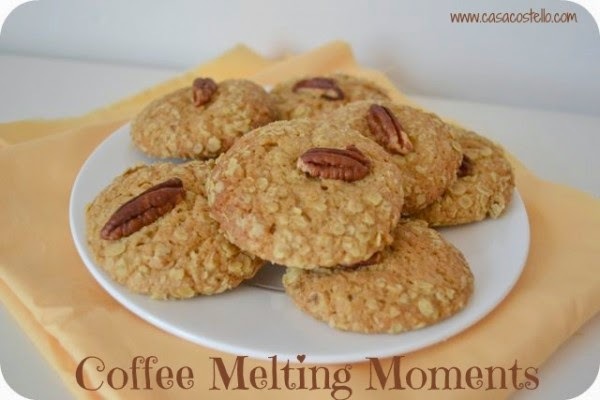 Helen at Casa Costello made these Coffee Melting Moments. These are adapted from ones her mum used to make when she was wee. I love the addition of coffee here. Elizabeth at Elizabeth’s Kitchen Diary made these nostalgic biscuits from her rural Canadian childhood. She says these are similar to ginger snaps. I love that crinkle on top! Delicious. Choclette at the Chocolate Log Blog made these coconut chocolate bars for Father’s Day and for Treat Petite. 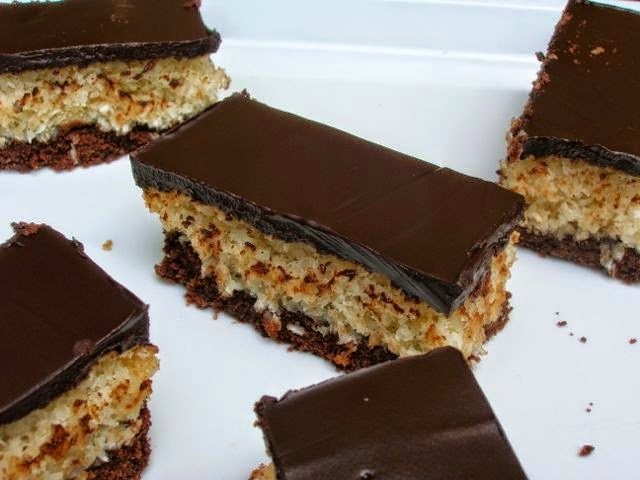 The recipe is reminiscent of Bounty Bars she says, which she used to get as a treat when she was a child. 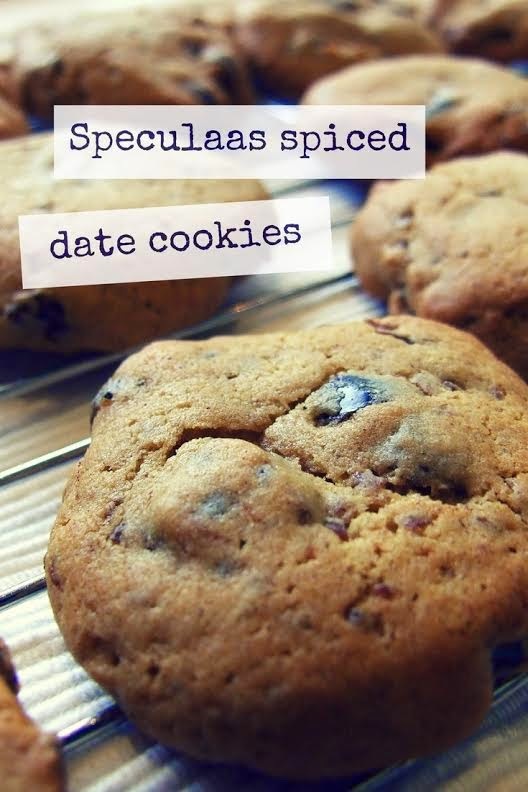 Helen at Family-Friends-Food made these speculaas spiced date cookies. Her mum had lost the original recipe, but it later turned up and Helen was transported back to her mum’s kitchen once more. 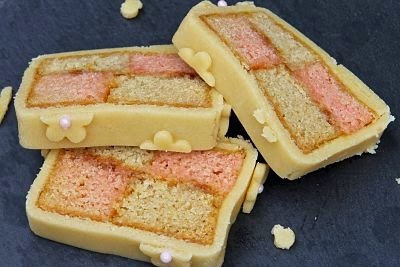 Kate the Gluten Free Alchemist made these rather delicious looking Battenberg Slices. Gluten free, with home-made marzipan, she was worried I wouldn’t allow these as they were slices of a big cake. But served up individually these are perfect. Ros at the More Than Occasional Baker made these very retro cornflake chocolate chip bites. She found them in a book her mum passed down to her. Ros loved this theme and said she was excited to see everyone else’s creations too. Caroline at Caroline Makes entered these Jap Cakes form her childhood. I’ve never heard of them, but they sound lovely, made with egg white, ground almonds and other ingredients. These sparked quite a conflab on Caroline’s website about the origins of the cake. Pop over and take a look! 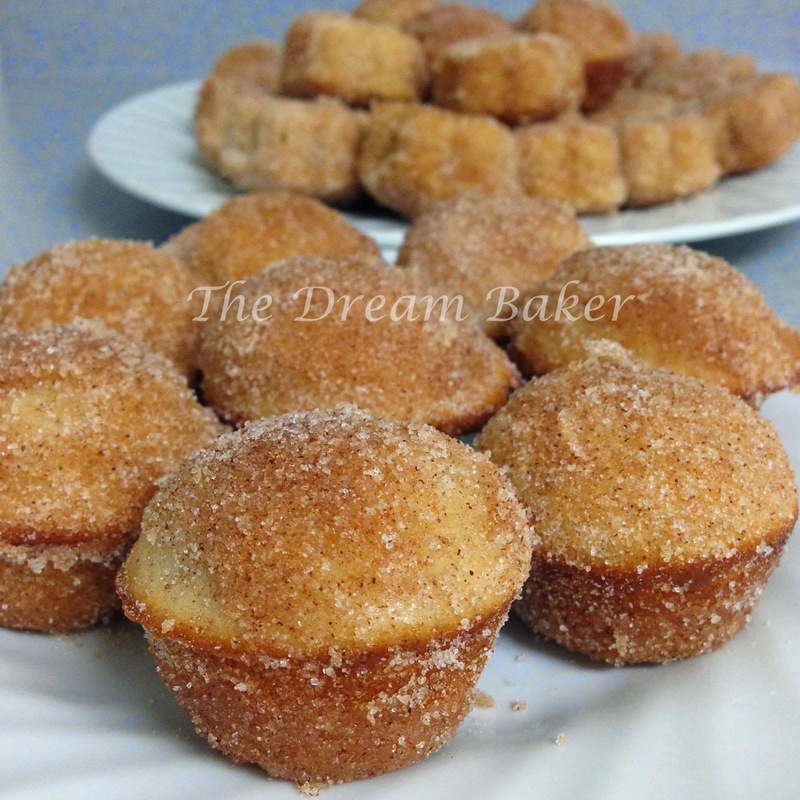 Back to the Dream Baker Kerene, who also submitted her cinnamon baked doughnut holes. Doughnuts take Kerene right back to her childhood and this adaptation of an Ina Garten recipe certainly makes me drool! 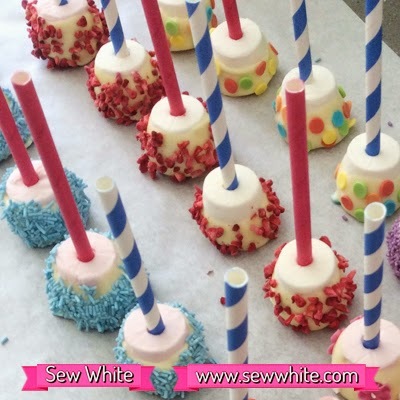 Sisley at Sew White made these yummy looking Marshmallow Chocolate Bites. These are a childhood treat updated to appeal to grown-ups also – with an added stick made from a straw. Kat, my baker in crime, from The Baking Explorer made these cola cupcakes. She made them with cola flavouring, an homage to her favourite sweets as a child – cola bottles. Decorated with cola bottles too they look scrummy. Lastly my entry, which is very similar to Sisley’s. We called these Top Hats and were made at every childhood party I was ever at. Chocolate, marshmallows and smarties, these are very easy to whip up in a flash. Easy for kids to make too. So that is the childhood round up for you. A huge thanks to everyone who took the time to enter their creations. Stay tuned to The Baking Explorer to find out July’s theme! Mmm loads of fantastic bakes here :) I never had those marshmallow treats until I moved to the UK but I do love them so now! Awww, such a brilliant round up and lovely to see how many people have revisited their childhood. What a fab bunch of nostalgic treats. It's great to see all those food childhood memories are still alive and kicking. Thanks for hosting! Mmm, you really got us reminiscing and with rather delicious results. Thanks for the round-up. Loving that battenberg wtih the flower decoration. I had an idea I'd hoped to submit but time ran away with me, I hope I can join in next month. Such great entries this month that sent us all back in time! Great to see what different treats we all enjoyed as children. What a lovely round up bringing us back to our childhood!